Now pursuing her associate’s degree in aircraft structural technology (AST), Giddens is one of a growing class of central Georgians look­ing for a career in the state’s second-largest and fastest-growing industry: aerospace. PwC’s 2017 Aerospace Manufacturing At­tractiveness Index, an annual report ranking nations and U.S. states on how inviting they are to aerospace manufacturing companies, places Georgia at the top of the list of U.S. states, and the U.S. at the top of the list of nations. The industry has an economic impact of more than $64 billion annually in Georgia, according to the Georgia Department of Economic Development, and aerospace products are the state’s largest interna­tional export market, with annual sales reaching more than $8 billion. Of course, large sales numbers mean a large workforce – aerospace companies currently employ more than 99,000 Georgians – and a large workforce needs a lot of educational resources. Middle Georgia State University’s (MGA) School of Aviation – the only public, four-year aviation school in Georgia – has programs de­signed to help students fill roles in every corner of the aerospace industry – from manufacturing to maintenance, from logistics to logbook. And as Georgia continues to cement its role as the top destination for aerospace industry in the world, MGA continues to expand its offerings to help prepare students for a career in making things fly. In a hangar at the south end of the Eastman Campus, where the Middle Georgia State School of Aviation is based, a turbine engine is mounted to a work stand. Two MGA students lean over it fitting combustors – the chambers where jet fuel is burned to power a jetliner through the sky. To the untrained eye, the engine is a hopeless tangle of tubes and hoses, fans, wiring, and other unidentified parts. To these students, this is just another day in class. Maintenance is a large part of the aviation industry, and with one of the U.S. Air Force’s largest maintenance depots and the world’s busiest commercial airport both within just a couple hours’ drive of the Eastman Campus, there is a lot of opportunity for a well-trained maintenance specialist to find a career in making sense of the thousands of parts that go together to make an aircraft fly. With a fleet of more than 800 aircraft making over 15,000 flights daily, Delta – with its more than 80,000 employees and its massive technical operations facility located at Hartsfield-Jackson Atlanta International Airport – is an attractive destination for the aviation-minded. And a new agreement with the Atlanta-based car­rier is helping MGA students become even more prepared to take on a role with the aviation giant. Under the agreement, Delta is providing MGA with a supply of decertified aircraft parts – parts being removed from service as the planes they fit are taken off the flight line – so that students can get hands-on experience working with the same equipment they’d see on the line at one of Delta’s maintenance facilities worldwide. In addition, Delta training materials – the same materials used to train the airline’s new employees – are being made available to students. The commercial airlines aren’t the only Georgia institutions in need of skilled aircraft mechanics – the federal government has recently authorized a direct hiring authority (DHA) for mechanics, machinists, electricians, sheet metal specialists, and other jobs at Robins Air Force Base. Citing “a critical hiring need,” the DHA has been put in place to fill a “severe shortage in qualified candidates,” according to the base’s website. Under the DHA rules, candidates can be fast-tracked into jobs by bypassing the usual competitive rating-and-ranking rules that govern federal hiring. “Our students are highly qualified to fill many of these positions,” says Kehayes. Of course, an aircraft is most at home when it’s in the air, and for that, you need a pilot. Fortunately for Georgia’s aerospace industry, MGA teaches Georgians how to do that as well. Like Cook and Giddens, Daniel Hambrice grew up around aviation. Both his mother and father, based in Washington, D.C., worked for the now-defunct Eastern Airlines – she as a gate agent, he as an operations manager. As a child, Hambrice spent a lot of time at what is now Ronald Reagan Washington National Airport. “My parents had flight benefits because they worked for Eastern, so I basically grew up flying,” Hambrice says. But it was only after he spent some time at two different universities as an unenthusiastic political science major did the now 30-year-old consider an aviation career for himself. After researching flight schools up and down the Eastern Seaboard, Hambrice settled on Middle Georgia State’s School of Aviation. He expects to graduate this fall with a B.S. in Aviation Science and Management with a track in flight. Hambrice is on track to become a certified flight instructor for MGA, which is a common step among the School of Aviation’s flight majors. After he builds up flight hours, Hambrice hopes to move on to a pilot’s job with a regional airline. His long-range goal is to become a pilot for one of the major airlines. Commercial aviation, however, isn’t the only career path open to MGA flight students. 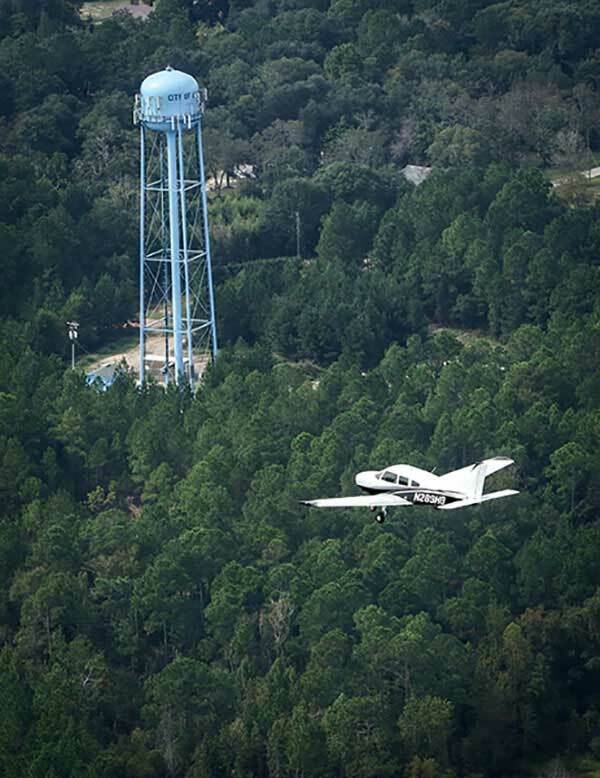 MGA is currently developing an agricultural aviation program, and is planning to partner with the Georgia Forestry Commission to utilize one of the commission’s new Albany-built Thrush 510G aircraft. This new program will allow MGA instructors to teach pilots how to safely apply fertilizers and pesticides from the air, as well as other aspects of agricultural flying. “We will prepare students for work in the ag aviation field and hope to expose them to the obvious safety concerns, ground operations, chemical and certification education, and flight operations,” says Adam Holloway, chair of the Department of Flight. The turbine-powered craft will also allow MGA to offer turbine engine transition training for existing agricultural pilots looking to upgrade their licenses. Until recently, students wishing to pursue a certificate or degree in aviation from MGA had to study at the University’s aviation campus in East­man. While the Eastman Campus at the Heart of Georgia Regional Airport is still the primary hub for aviation studies, certain programs are spread­ing statewide. Flight training became available at Macon Downtown Airport in spring 2017 and will soon be made available at Cook County Airport in Adel, opening up new access to pilot certificates to Georgians in central and south Georgia. Courses in the AST and aircraft main­tenance technology (AMT) program will soon be offered in the evenings on the Cochran and Dub­lin campuses, as well, opening up a new avenue of advancement for aerospace workers in those parts of the state. There’s no plan for the growth to stop there. The University’s aviation strategic plan features plans to expand flight training to coastal, western, and north Georgia, and metro Atlanta. Partner­ships and agreements with the state’s largest aviation employers are also – pardon the pun – waiting in the wings. - Sheron Smith contributed to this article. This article originally appeared in the spring 2018 issue of MGA Today. See more School of Aviation photos at he online version of the magazine.